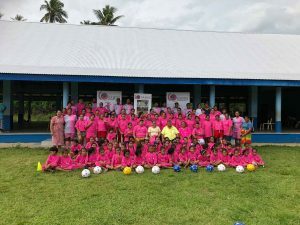 A five day course which focuses on coaching children aged 6-12, the participants aim to develop grassroots football in Samoa by learning how to effectively coach different age groups. FFS Technical Development Officer Tuileifiifi Martin Tamasese officially opened the course, encouraging the coaches to invest their effort into enhancing their skills so that they can share their knowledge with the younger generation of Samoa. FIFA instructor Simon Toselli compared the course to “building the foundation of a house”, urging coaches to concentrate on player development at a grassroots level in order for “our kids to do better in the future”. FIFA made sure the strong base of 27 active coaches and FFS staff were well equipped, providing them with Adidas apparel, field equipment and classroom tools to carry out the course. Age appropriate football development was a key focus with coaches having to plan, implement and evaluate activities for various age levels. Two training sessions a day allowed coaches to gain hands on experience and work on their delivery of activities for each age group. “It is important that we create the best environment and opportunities for the kids to develop through training and competitions”, stated Toselli. “Grassroots is a key stage of development and this course is a starting point for coaches to develop and support their players”. The last session will include a grassroots festival combining all age groups, where coaches will focus more on the kids rather than their coaching skills to ensure there is optimal participation in a positive learning environment. Upon completion of the course, participants will be accredited with a FIFA D1 grassroots licence, allowing them to coach junior players aged 6 to 12.